Wrexham player-manager Andy Morrell was angry after loan signing Andy Bishop was unable to play for them after a delay in international clearance. 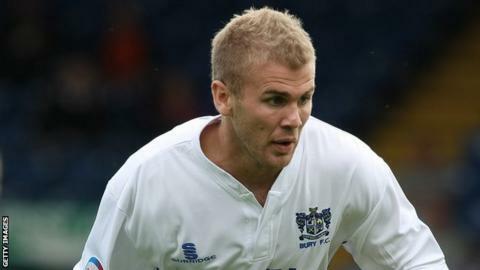 The Bury striker had to sit out Wrexham's 4-1 Blue Square Bet Premier win at Cambridge United on Saturday. "It's a shocker and it's a hindrance for us being in Wales. Why can we not get the paperwork done and an English club can?" Morrell said. "It's a joke. The clearance hasn't come through which is a disgrace." "It's just simply not fair, even though we play in the [English] league we're under the Welsh FA and we have to get international clearance," Morrell said. "It was all done Thursday, the paperwork was sent off. Both FAs have agreed to it and it's just sat on Fifa's desk at the minute. "They've had all the internationals and they can't be bothered to press the button. "If I get a centre-half injured next weekend and Westy [defender Chris Westwood who is currently sidelined with a groin injury] isn't available, I can't be 100% guaranteed of a player playing for me if I get him on loan. "But an Alfreton or a Luton can, so how is that fair? "We just have to have somebody, if we are going to be under the Welsh FA, to be on our side and to be pushing it, so that we can do it quickly. "On transfer deadline, if I don't get my player to sign it off before five o'clock to be back with us then the Welsh FA is shut over the weekend, so nobody is there to okay it. "So how is that fair when the transfer deadline goes to 11 o'clock? "I don't know, maybe I'm just bitter I suppose, but I feel more for Bish [Bishop]. I've brought him in on loan and he's going to be the only player on loan not play for a team!" The international clearance for Bishop should now be received in time for Wrexham's next match, a crucial trip to promotion rivals Luton next Saturday.